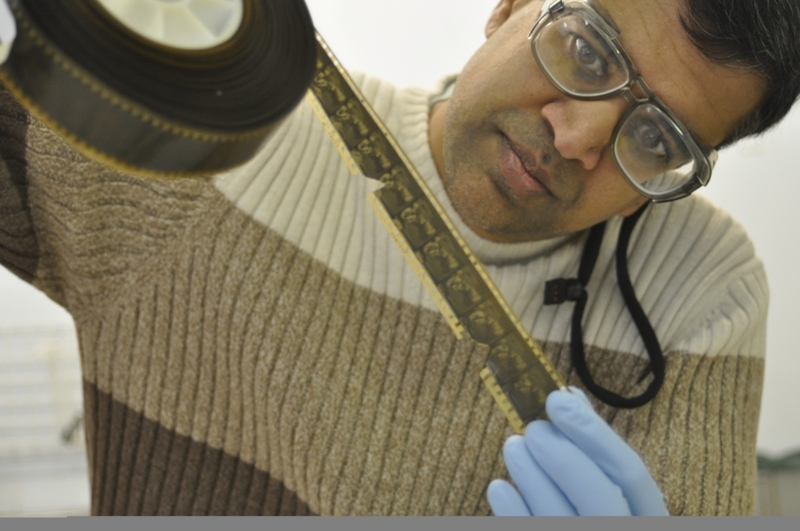 Archivists and conservators are well aware of the hazards posed by cellulose nitrate film stock. Nitrate films are highly flammable; they release toxic gases; and the chemical structure of their base support breaks down, destroying the image. Most movies made before the early-1950s used nitrate film stock, and surviving prints of the era generally reside today in archives or private collections. Because of cellulose nitrate's inhererent instability, these films, many of which are historically significant, not only pose real fire and health concerns, but are also at risk of being lost forever to decomposition. These general characteristics of nitrate film have been known for some time, but specific, reliable information about the material's behavior is contradictory, inconclusive, or lacking altogether. Dr. Heather Heckman, the Director of Moving Image Research Collections at the University of South Carolina, devised the Wisconsin Nitrate Film Project to help address this problem. Taking an interdisciplinary approach, the project combined chemical analysis of heritage nitrate film samples, extensive review of historical and contemporary literature, and information from modern professionals who deal with the practical aspects of handling, storing, and shipping nitrate film. Graciously funded by a Preservation and Access Research and Development Grant from the National Endowment for the Humanities, with support from The Graduate School of UW-Madison, this project was a joint venture among the Wisconsin Center for Film & Theater Research, the Mahanthappa Research Group in the Department of Chemistry at the University of Wisconsin–Madison, and the Wisconsin Historical Society. We are excited to disseminate our research and findings through our website. The Wisconsin Nitrate Film Project's final white paper, which was submitted to the NEH in December 2015, offers the full and definitive account of our undertakings, and we invite you to read it here. Our website offers a summary account of the project, supplemented with images and videos detailing our activities in the chemistry and preservation laboratories. The Project Overview section goes through the origins of the project, the personnel involved, and our goals and working hypotheses in more detail. The Chemical and Physical Testing section explains our sample selection and the key tests we performed, particularly our accelerated aging trial. It will also offer a brief summary of our results and findings and will link you to a more extensive discussion of the chemical analysis. The Survey section reports the findings of a survey that we sent to various archives across the United States and provides some insight into the actual, day-to-day practices of nitrate storage, handling, and shipping at different types of institutions. The Oral History section provides audio recordings and written transcripts of interviews that we conducted with veteran professionals who have worked with nitrate film in a variety of capacities. The Annotated Bibliography provides a list of the hundreds of sources on cellulose nitrate that we gathered as historical background. The Avenues for Future Research section outlines a number of lingering scientific questions and offers suggestions for useful steps that could still be taken. Under Funding and Partners you will find more information about the organizations and institutions that have given us valuable financial assistance and support. We hope that you find the information here interesting and valuable. If you have any questions or ideas that might help us explain our findings more effectively, please contact us at askmovies@wisconsinhistory.org.